Gelee Royal aktiv drink - wolting-internationals Webseite! 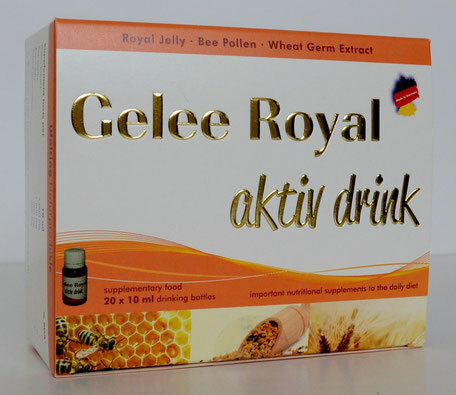 Gelee Royal aktiv-drink is a biological supplementary food made from the bee substance royal jelly (secretion of young bees), biologically processed wide-range pollen, honey and entire extract of wheat germs. These compounds are dissolved in orange juice. Recurrent situations of stress, pressure of business, too short and rare phases of restoration, lack of exercise, wrong nutrition, psychological strain and fear more often lead to physical and mental impairment. These factors accelerate the physiological aging of the body. Gelee Royal aktiv-drink provides the body with high-quality nutrients and thus increases its resistance in a natural way. The stated recommended daily dose should not be exceeded. Shake well before consumption. Turbidity and bottom set are a sign of quality and have no influence on the quality of the product. Food supplements should not be used as a substitute for a varied and balanced diet and a healthy lifestyle. Store the product out of the reach of small children. Storage: Keep away from direct sunlight: Store at room temperature. It should be noted that there may be a hypersensitivity in allergic patients on revenues of wheat germ extract, royal jelly, bee pollen and honey. This product is produced under sanitary conditions, in accordance with the determination of our HACCP concept, as well as GMP and ISO 9001-2008 . It will be used exclusively raw materials with specified food quality. It does not use genetically modified organisms, nano-materials and hormones. There are no pesticides available and it is free from TSE/BSE.